The Climbing Wall is located in the center of the community center and stands 38 feet tall. The wall features 6 top anchors with several route options with a range of difficulty levels. 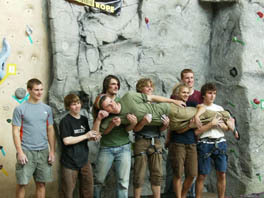 Use of the climbing wall is included in MCC memberships and daily passes. Monday through Friday - 5:30 p.m. - 8:30 p.m.
Saturday & Sunday - 1:00 p.m. - 6:00 p.m.
Waivers are required for all climbers and must be signed by parent/guardian. 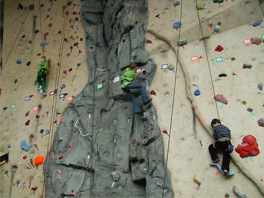 The Climbing Wall is available to rent for exclusive use by groups during closed hours. Arrangements must be made in advance with the Event Coordinator. Flat fee for up to 15 users is $75.00 for 2 hours. 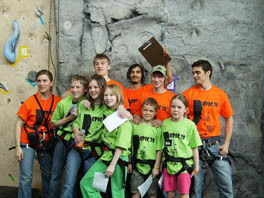 16 or more climbers is $5.00 for each additional climber. Rentals are for 2 hours unless arranged with Event Coordinator for larger groups. Climbing Wall rentals depend on staff availability and must be scheduled in advance. All climbers must have a waiver on file with the MCC. A parent or guardian's signature is required on a minor's waiver. Waivers are available at Guest Services.